Chris Grabenstein hasn't forgotten how it feels to be a sixth grade boy. It's evident in his ghost stories for middle school readers. Few middle school boys would turn down a book about ghosts, zombies, and a hidden treasure of Confederate gold. Throw in voodoo, cemeteries, and the new school year, and it's obvious that Grabenstein knows the way to a reader's heart. The Smoky Corridor, the third book to feature Zack Jennings and his dog, Zipper, is another winner from the author who won Anthony and Agatha Awards for previous books in this series. Zack's father grew up in North Chester, Connecticut, but it's Zack's first year at the Horace P. Pettimore Middle School. Zack isn't there long before the boy who sees ghosts knows that the school is haunted by the dead steamboat captain who left his mansion for a school. And, old friends turn up here, ghosts from Zack's past who say they're present as guardians for the kids because there is a voodoo master and black magic stirred up in the school. One school story involves a 1910 tragedy involving a fire, two boys and a teacher. Zack has seen the two boys who died, but, they're just one more element in the mysterious past of the school. It only takes a Saturday to set ghosts, zombies, teachers, janitors, and Zack and his friends on a collision course of violence and death. Zack Jennings has a special gift, the ability to see ghosts. He's lucky in that his stepmother, Judy, sees them and believes him. He's lucky in his choice of friends, including a new schoolmate, Malik Sherman, whose ability to solve puzzles will be invaluable. And, he's lucky that Chris Grabenstein knows that brain-eating zombies, Civil War soldiers, and secrets kept from parents, will appeal to middle school readers. 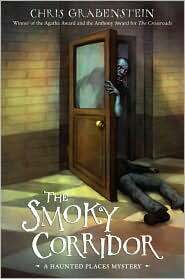 We're lucky that Grabenstein's third book for young readers, The Smoky Corridor, is another hit. The Smoky Corridor by Chris Grabenstein. Random House, ©2010. ISBN 9780375865114 (hardcover), 336p. FTC Full Disclosure - I bought my copy of the book. I so admire those who can remember what it's like to be young! I think I enjoy books like this because they remind me. I'm not a middle grade boy but I bought my copy too. Thanks for the great review, Lesa. Now we must get you on Random House's Mailing list! I admire them, too, Kathy, because I'm not so good at it, although I do remember what it was like to not be one of the popular kids. But, Chris has everything down pat. Me, neither, Pat, but I didn't want to wait until I got a copy at the library. You're welcome, Chris. Not having seen the codes in an actual book, I can only say that they looked great on the Kindle. And, of course, you can enlarge it if you want to look closer. But, I was very satisfied with it. And, of course, I was satisfied with The Stormy Corridor! I must try this series! Thanks for the review. I hope you do try this series. I really like it. And, I think you'll be hooked after reading the first one. This sounds like a book I would have loved as a kid! In fact..it sounds like one I would love now..as a bigger kid..er..I mean adult. I love Chris Grabenstein's books, adult or juvenile, as "a bigger kid," Kris. You might want to try them!